Recently I was boating on the Rappahannock River in Virginia and ran up to the harbor of Urbanna for fuel. While in Urbanna I saw the stern of a beautiful, classic sailing yacht and inquired about her of the marina owner. He explained that a lady owned the boat and that it was for sale. 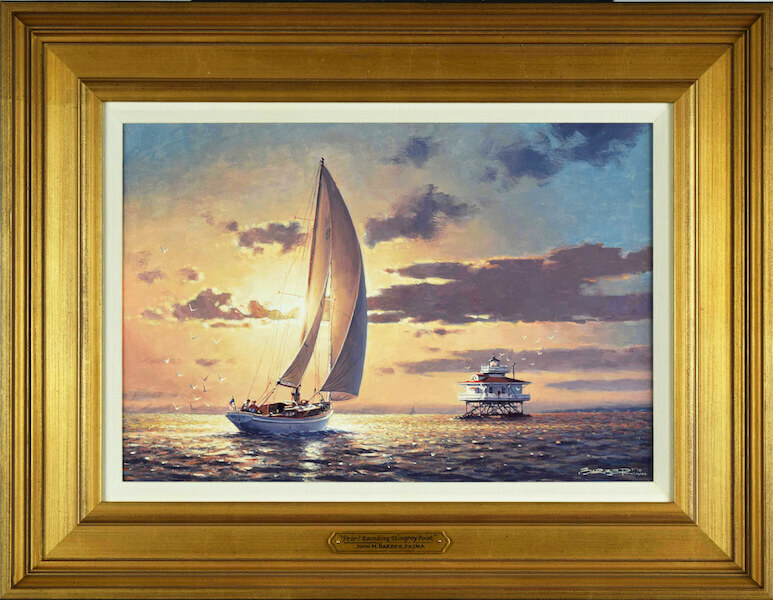 I ask him to pass on my business card to her with a note suggesting that if she were interested I would love to do a painting of the boat. When I arrived at my studio the following Monday morning I had a call from Captain Lori Close, the owner of Pearl and she was just closing on the sale of the vessel and would love to have me paint her. Pearl was a true classic cutter, 47′ overall, having been designed by Philip L. Rhodes and built on City Island, NY between 1937-38. Captain Close had owned the sailboat for twelve years and lovingly restored her. 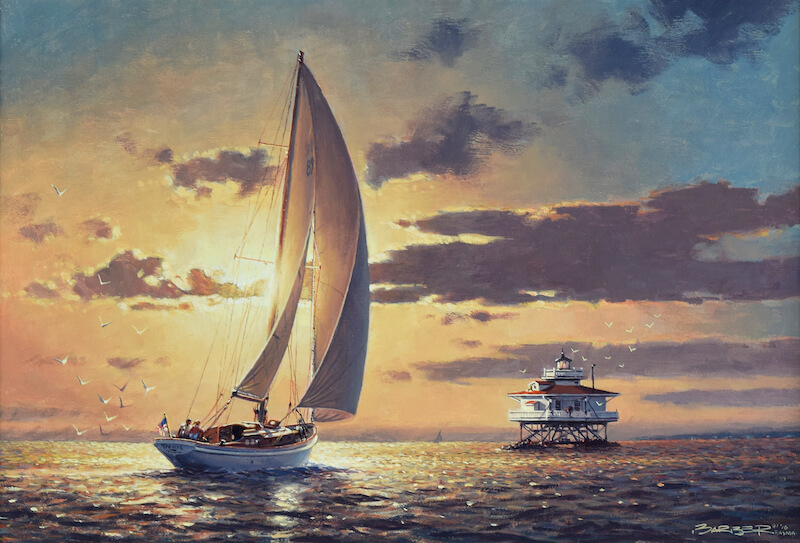 We discussed how the boat should appear in the painting and we decided that Pearl should be approaching the original Stingray Point Lighthouse with Gwynn’s Island beyond. Lori grew up on the island and sailed this area for years. The lighthouse was built at the mouth of the Rappahannock River in the Chesapeake Bay in 1858, the lighthouse’s cottage removed in 1965 but its automatic beacon still serves as an aid to navigation today. We arranged to make reference photos of the boat on the Rappahannock the morning her new owner sailed away, back to her new home near Annapolis, Maryland. I’ve enjoyed working with Lori and creating a painting of her beloved Pearl. 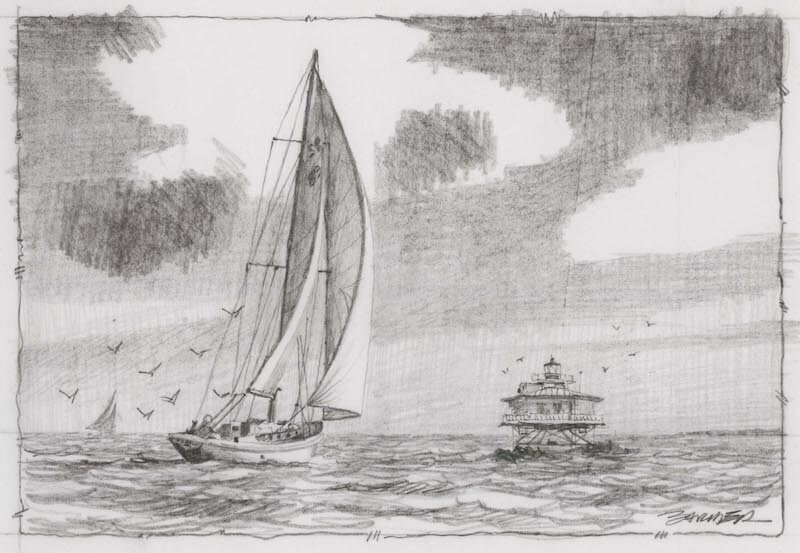 Below is the pencil sketch that I made for Lori illustrating the painting to come as well as the framed final oil. The final painting beautifully framed and presented with its custom-made frame, nameplate and painting light.